Exhibition poster of "Altid Mange Problemer" at Kunsthal Charlottenborg, Copenhagen, Summer 2017. Photo: Latitudes. 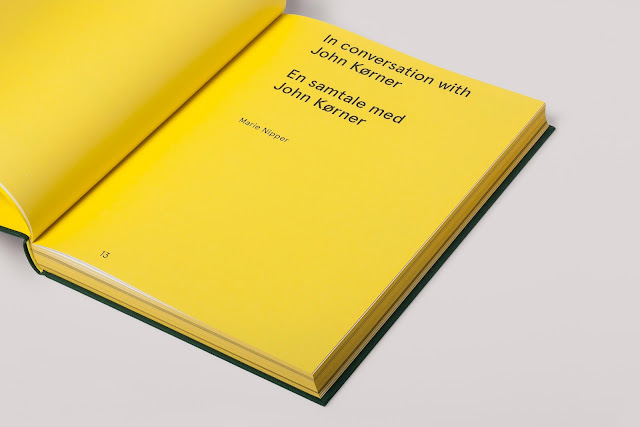 Last Summer, Max Andrews of Latitudes was invited to contribute an essay for the forthcoming monograph of John Kørner's work published by the Danish editorial Roulette Russe and designed by Spine Studio. The publication is out now and includes essays by Max, London-based writer Oliver Basciano, and a conversation between the artist and Marie Nipper, curator of John's recent mid-career exhibition in Kunsthal Charlottenborg, Copenhagen. 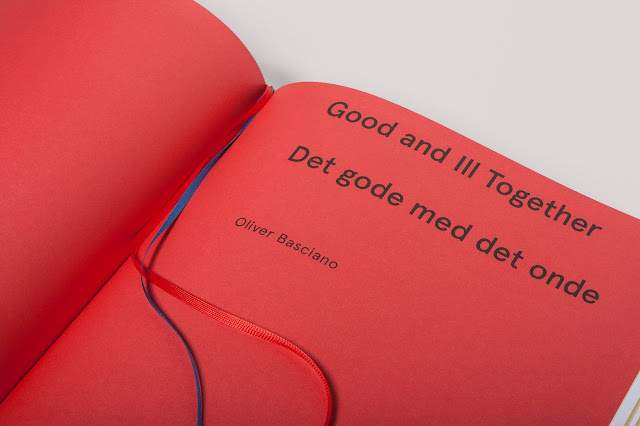 The 280-page bilingual Danish/English monograph will be launched on March 2, 2018, at 4:30pm, in Kunsthal Charlottenborg's Apollo Kantine, though it will become available for online orders from February 26. (Above and following): Photos: Finn Wergel Dahlgren. Courtesy Roulotte Russe. 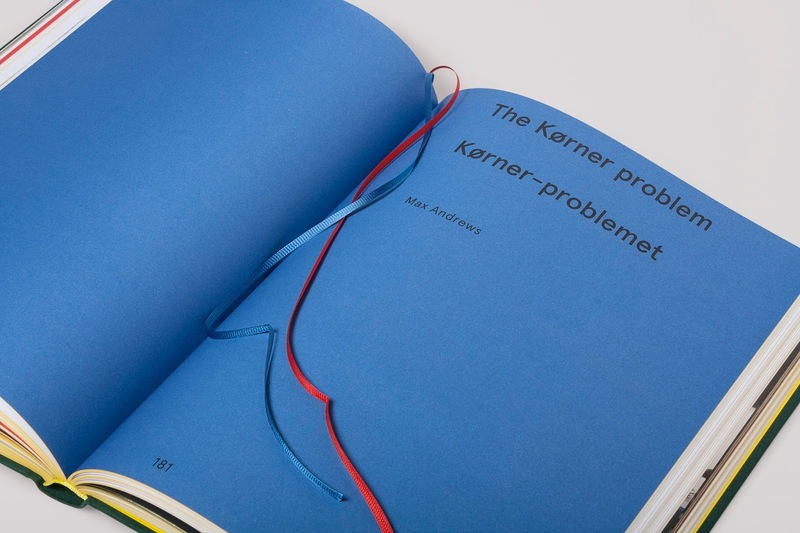 (...) "The apparently ‘wicked’ problems and appalling catastrophes that interpenetrate Kørner’s works are manifold. The upsurge in jihadist terrorist activity in Europe since 2015 and its fallout are unavoidable (whether vestiges of the Charlie Hebdo shootings and the Bataclan attacks in Paris, suicide bombings in Brussels and Manchester; or truck attacks in Nice, Berlin, Barcelona; rampaging attacks in London, and so on). The civil war and the rise of ISIL (ISIS, Daesh) in Syria and the exacerbating effects of climate change and mega-drought that affected the region are inescapable. The European debt and migrant crisis are here. Yet elsewhere Kørner also brings to mind what at first seem like unrelated problems: the 2011 Tōhoku tsunami and the calamity of the Fukushima nuclear power plant meltdown, human trafficking, et cetera, states of exception that seem to confirm that the problem is evermore radical, atrocious, ungrounded—more diffuse while remaining intractably real. American pop star Ariana Grande knows this as well as Kørner. Released in spring 2014, three years before the suicide bombing of her concert at Manchester Arena, her most successful single to date is titled “Problem”. We are witnessing new kinds of wicked problems and Kørner paints accordingly." 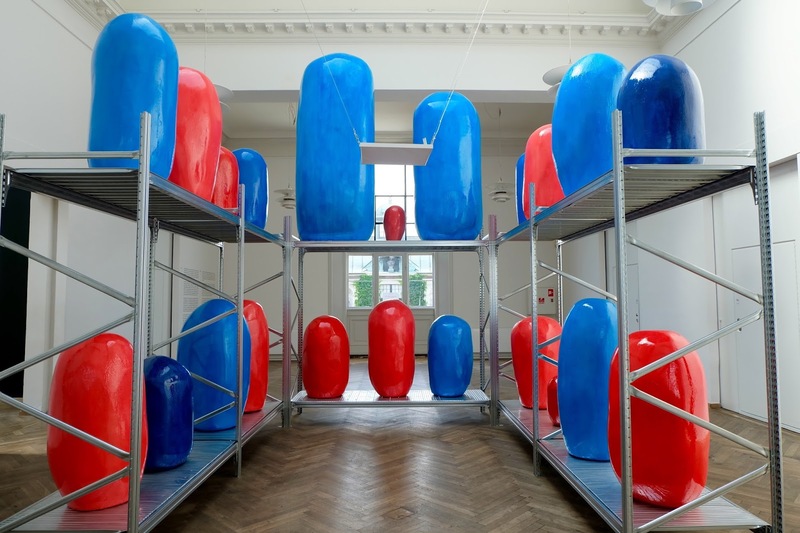 In preparation for the catalogue essay, in July 2017 Latitudes visited Kørner's impressive "Altid Mange Problemer" mid-career exhibition at Kunsthal Charlottenborg, the largest exhibition of his works to date, gathering paintings and sculptural pieces from 2004 to the present. (Above and following): Photos by Latitudes. 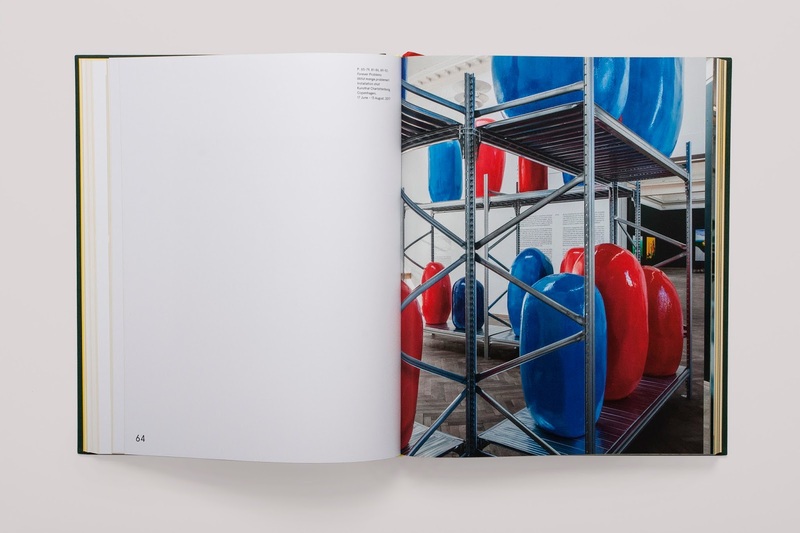 Max has previously written on John's work for the catalogue of his 2006 exhibition "Problems" at Victoria Miro Gallery in London. Latitudes' first visit to Copenhagen also involved Kørner's work, as we visited his solo show 'ARoS Bank' at the ARoS Århus Kunstmuseum, Denmark (13 June–10 September 2006), which became the subject of our first blog post over a decade ago, in September 2006 (!). After much anticipation, we are elated to see (and touch!) 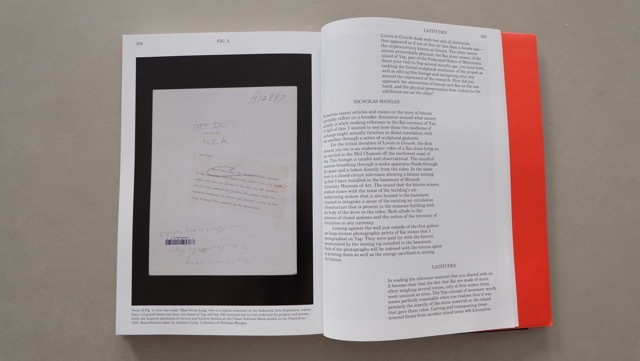 Latitudes' five-part interview with Nicholas Mangan as part of his exhibition catalogue "Nicholas Mangan. 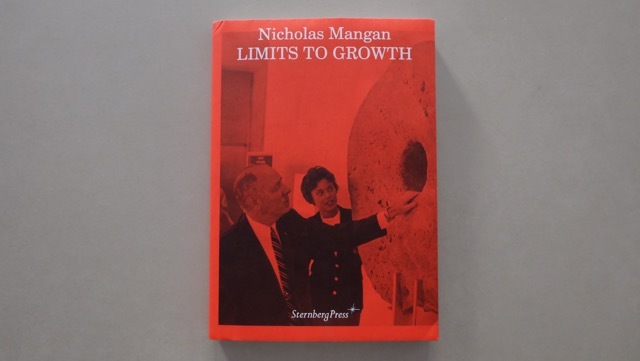 Limits to Growth" (Sternberg Press, 2016). 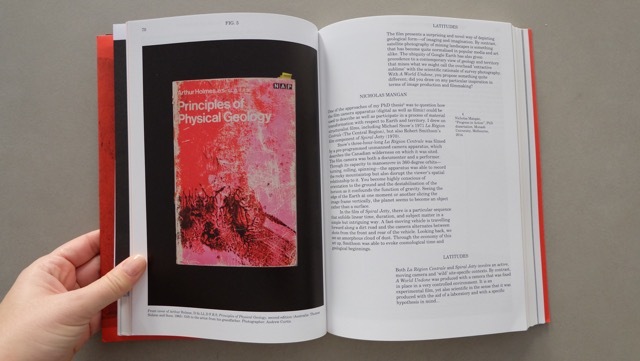 The publication is designed by Žiga Testen and includes newly commissioned texts by Ana Teixeira Pinto and Helen Hughes, alongside illustrations of Mangan's work and historical source material. The five-part interview weaves together a discussion around five of his recent works ‘Nauru, Notes from a Cretaceous World’ (2009), ‘A World Undone’ (2012), ‘Progress in action’ (2013), ‘Ancient Lights’ (2015) and his newest piece ‘Limits to Growth’ (2016) commissioned for this exhibition survey. 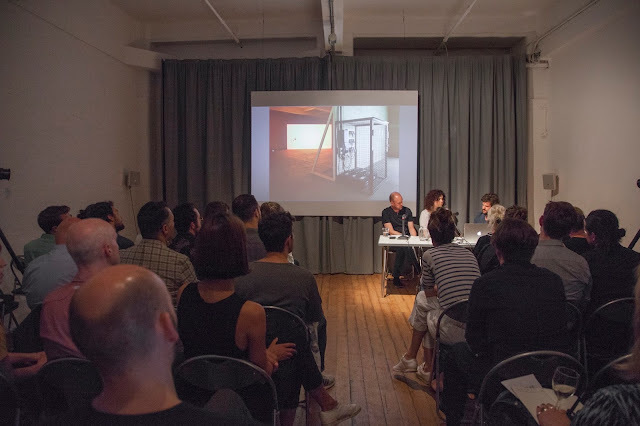 Latitudes’ dialogue with Mangan, began around a research trip to Melbourne in 2014, and continued in the form of the public conversation event that took place at the Chisenhale Gallery, London, in 2015, as well as over Skype, email, snail mail and walks. 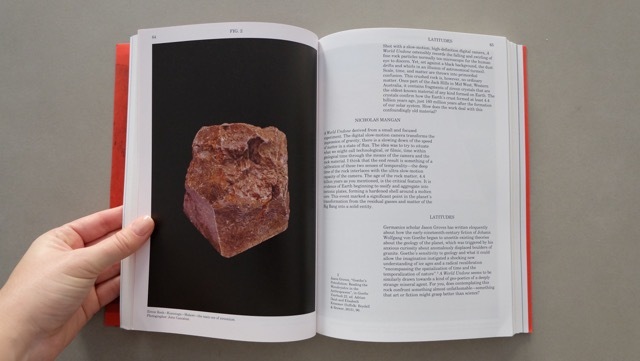 The publication release coincides with Mangan's eponimous exhibition survey which began in July in Melbourne's Monash University Museum of Art and just opened this past weekend in Brisbane's IMA. The show will further tour to Berlin's KW Institute for Contemporary Art in Summer 2017. "Nicholas Mangan. Limits to Growth"
Publisher: Sternberg Press with the Institute of Modern Art, Brisbane; KW Institute for Contemporary Art, Berlin; and Monash University Museum of Art, Melbourne. 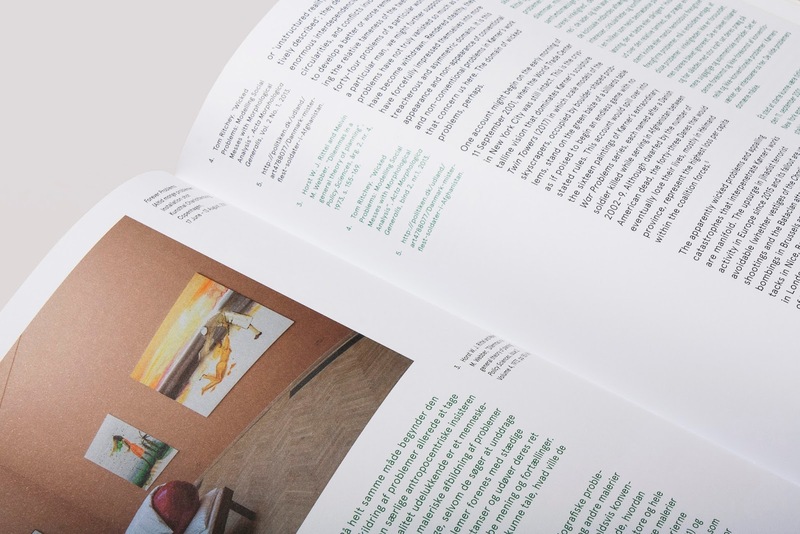 Editor: Aileen Burns, Charlotte Day, Krist Gruijthuijsen, Johan Lundh. Max Andrews' of Latitudes feature article 'Landscape Artist', Frieze #172, June–August 2015. Nicholas Mangan, ‘Ancient Lights’ (2015). 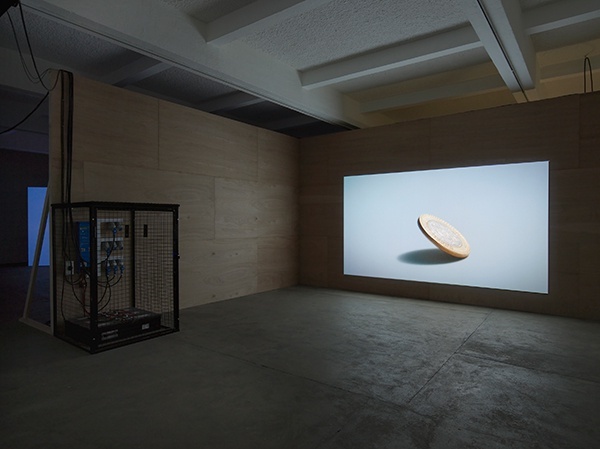 Installation views, Chisenhale Gallery, 2015. Co-commissioned by Chisenhale Gallery, London and Artspace, Sydney. Courtesy the artist; Labor Mexico; Sutton Gallery, Melbourne; and Hopkinson Mossman, Auckland. Photo: Andy Keate. We have just wrapped-up an interview with Melbourne-based artist Nicholas Mangan to be published by Sternberg Press as the catalogue of his forthcoming solo exhibition ‘Limits to Growth’, co-produced by Monash University Museum of Art (MUMA), Melbourne (opening July 20) and Institute of Modern Art (IMA), Brisbane (where it will be on view from October 29), it will later travel to Kunst-Werke Institute of Contemporary Art in Berlin (summer 2017). 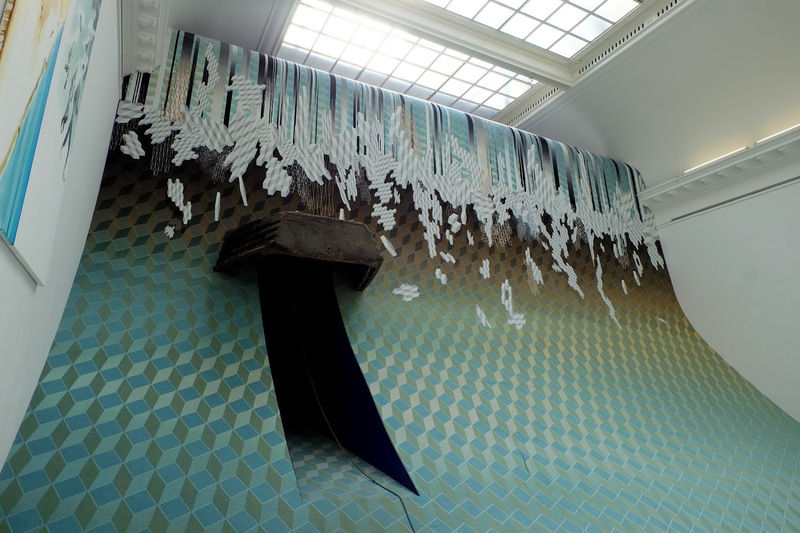 The five-part interview weaves together a discussion of his recent works ‘Nauru, Notes from a Cretaceous World’ (2009), ‘A World Undone’ (2012), ‘Progress in action’ (2013), ‘Ancient Lights’ (2015) and his newest piece ‘Limits to Growth’ (2016), to be premiered at Monash University Museum of Art (MUMA). 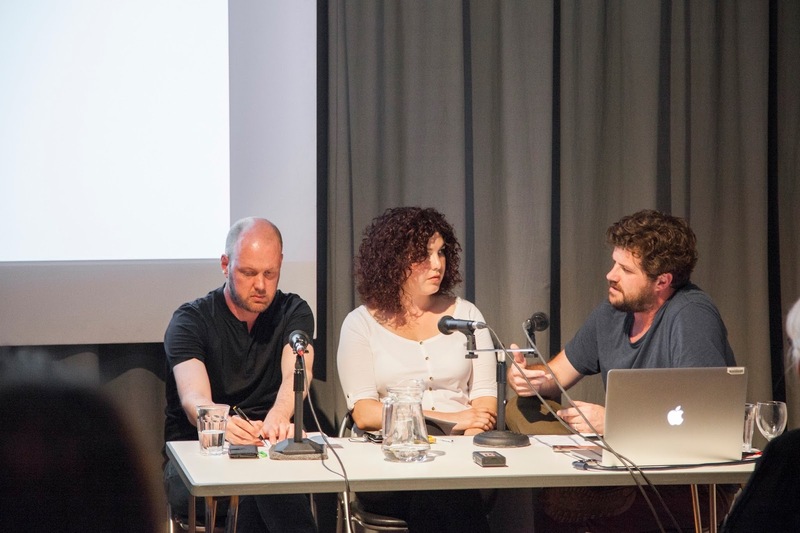 Part of an ongoing dialogue with Mangan, it developed from a public conversation event that took place at Chisenhale Gallery, London on 7 July 2015. ‘Limits to Growth’ references a 1972 report commissioned by the Club of Rome that analysed a computer simulation of the Earth and human systems: the consequences of exponential economic and population growth given finite resource supplies. The overlapping themes and flows of energies in the five of Mangan’s projects discussed in the interview might be read as an echo of the modelling and systems dynamics used by the simulation in order to try and better understand the limits of the world’s ecosystems. 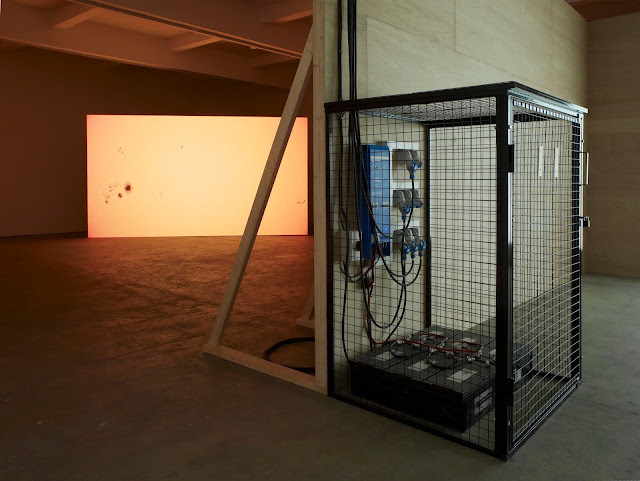 Mangan is presenting ‘Ancient Lights’ (2015) at his Mexico City gallery LABOR on April 22, a work co-commissioned by Chisenhale Gallery in London and Artspace in Sydney. In conversation between Latitudes and Nicholas Mangan, Chisenhale Gallery, 7 July 2015. Photos: Manuela Barczewski. 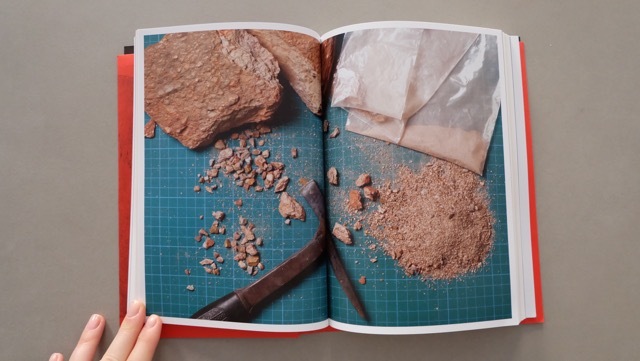 Mariana Cánepa Luna, 'What Lies Underneath', interview with Nicholas Mangan, Mousse Magazine #47, February–March 2015. El próximo 31 de enero inaugura en el Espai d'art Contemporani Castelló (EACC) la exposición colectiva "7.000.000.000", un proyecto que parte de la idea de desarrollo sostenible. La exposición está comisariada por David Arlandis y Javier Marroquí. Arlandis y Marroquí han invitado a una serie de autores a contribuir textos para el catálogo digital, entre ellos a Mariana Cánepa Luna de Latitudes que ha escrito sobre Time/Bank, el sistema económico alternativo creado en el 2009 por los artistas Anton Vidokle y Julieta Aranda. Podéis leer o descargar la publicación desde este enlace. Para la ocasión, como avanzan los comisarios en este texto, Time/Bank abrirá una sucursal "y colaborará con otra iniciativa similar, la Ecoxarxa, que se está desarrollando fuera del ámbito artístico. Time/Bank es un proyecto que consta de una instalación en la que podemos ver material diverso y documentación relacionada con las primeras iniciativas de banco de tiempo. La segunda parte trata de poner en marcha esa sucursal de banco de tiempo, con voluntad de continuidad, en la ciudad. Lo que se persigue es favorecer la implantación real de un modelo económico alternativo donde se intercambia con el tiempo como moneda." 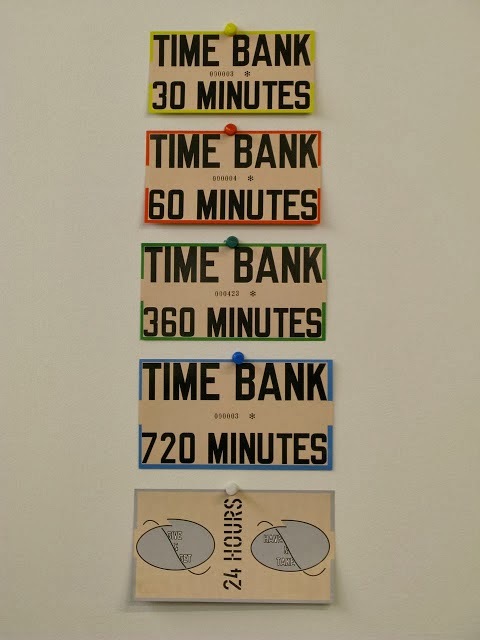 Time/Bank en dOCUMENTA (13), 2012. "Como acertadamente señala el antropólogo teórico David Graeber en su ensayo “The Sadness of Post-Workerism” (La tristeza del post-laboralismo), una de las ideas más ignoradas y, sin embargo, más poderosas y perdurables del marxismo, es que el mundo no solo consiste en la producción de mercancías que puedan ser compradas y vendidas, sino en acciones y procesos. El sistema económico alternativo Time/Bank, de Anton Vidokle y Julieta Aranda, que utiliza el tiempo como unidad de cambio, se concretó en 2009, un año después de que la crisis actual llegara a su punto álgido. Time/Bank evolucionó de forma natural a partir de PAWNSHOP (2007), su negocio de préstamos a corto plazo para obras de arte, situado en un local comercial de la calle Ludlow, en Nueva York. Ambas iniciativas median inquietudes en torno a la circulación y la distribución, temas que siguen presentes en sus prácticas artísticas, y que posiblemente estén mejor ejemplificadas en e-flux, el servicio de mensajes por correo electrónico que fundaron conjuntamente en 1999, y que se utiliza dentro del mundo del arte para difundir información sobre acontecimientos relacionados con el arte, exposiciones y proyectos, entre sus más de 90.000 suscriptores electrónicos. David Graeber, “The Sadness of Post-Workerism or“Art And Immaterial Labour” Congreso: A Sort of Review (Tate Britain, sábado 19 de enero de 2008)”. Editado en The Commoner, 5 de diciembre de 2013. Jolien Verlaek, "Working With That 'We-Feeling'”, Metropolis M núm.1, 2011. Billetes Time Bank diseñados por Lawrence Weiner. "7.000.000.000" permanecerá abierta hasta el 27 de abril 2014. 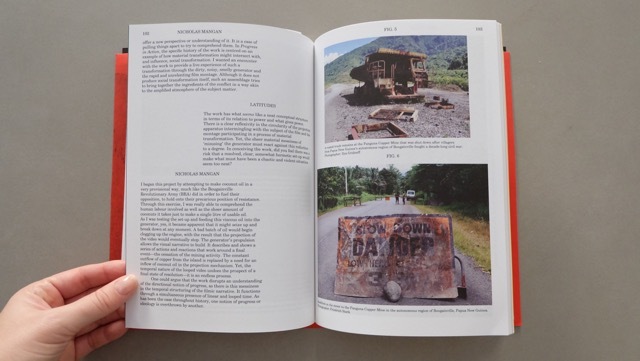 We are currently finalising and proof-reading the 'Amikejo' publication (see previous posts here and here), which concludes the year-long exhibition cycle at the Laboratorio 987, MUSAC (Fermín Jiménez Landa & Lee Welch's show is on view until 15 January 2012). The volume will be available in Spring 2012 and will be distributed by Mousse Publishing. "Have you ever heard the story of the African fisherman? In the early light of dawn, he would set out to sea in his little boat, fish for a few hours, return to port, sell his catch and then spend the rest of the day in the shade of a tree on the beach, contemplating the meaning of life and other pleasant thoughts. An economist from the World Bank appeared one day and asked him why he didn’t take advantage of all that spare time by fishing longer, and going further out to sea with a larger boat. This would bring in more fish and thus more profit. In the long run, this would enable the fisherman to buy more and even bigger boats, and even hire people to do the work for him. Eventually, he could make so much money that he wouldn’t need to work anymore and could afford to lie on the beach the whole day. At which the fisherman laughed and asked the economist, “Why would I go through all that trouble?” The history of Western society’s relationship with time clearly illustrates, however, that it is the economist who had the last laugh, not the fisherman." Theo Beckers was Professor of Leisure Studies at Tilburg University and is now on the faculty of the Tilburg Sustainability Center, the Netherlands, and Visiting Professor at the Chinese Academy of Sciences, Beijing. Translated from the Dutch by Klaas van Gorkum. 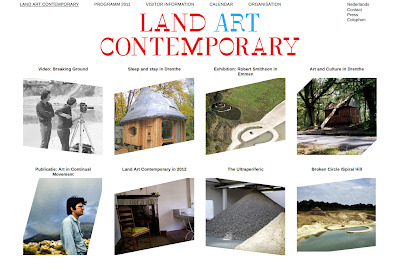 Land Art Contemporary year-long initiative showcases works of art located in the countryside of Drenthe, a province in the northeastern Netherlands, which will be complemented with an international events programme dealing with the contemporary aspects of Land art. Starting on 17 September 2011, the programme is linked to the 40th anniversary of the creation of Robert Smithson's film Broken Circle/Spiral Hill in Emmen for the exhibition Sonsbeek 1971. 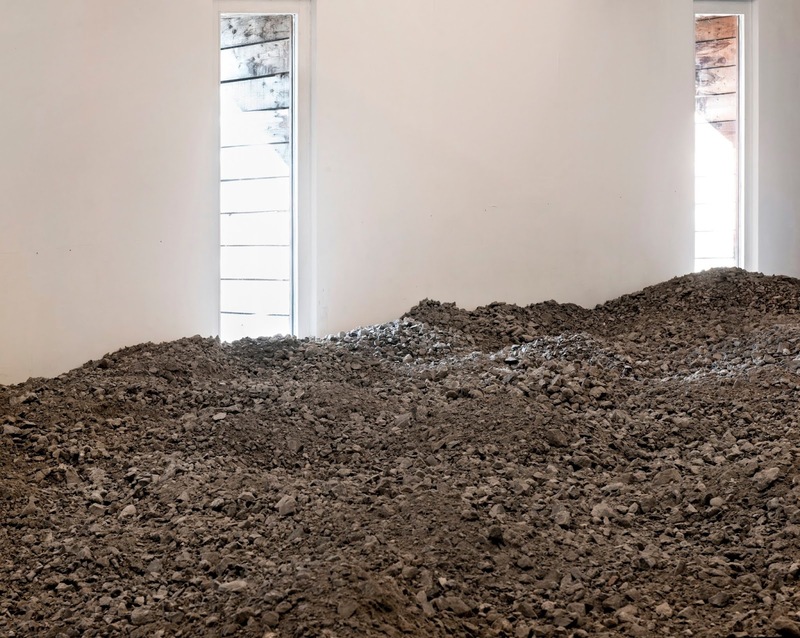 Coinciding with the anniversary, Land Art Contemporary kicks off with the exhibition 'Robert Smithson – Broken Circle/Spiral Hill Revisited', at the Centre for Visual Arts (CBK) in Emmen. The exhibition's star piece will be the recently completed film 'Breaking Ground: Broken Circle/Spiral Hill' (1971–2011), uncompleted due to Smithson's untimely death in 1973, which is now finally produced, following his instructions for direction and editing, by his widow Nancy Holt in collaboration with SKOR. The film will also be screened once on 22 September at the Stedelijk Museum Amsterdam. Holt will introduce the video. 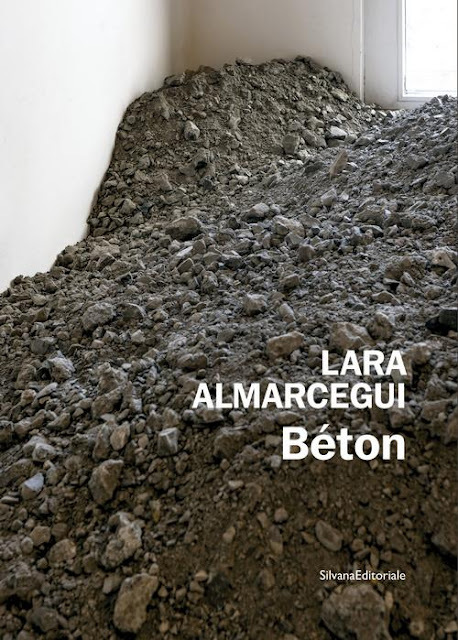 Parallel to this major exhibition, SKOR is also organising The Ultraperiferic (17 September – 27 November 2011), an exhibition that will feature the work of Lara Almarcegui (ES/NL), Jorge Satorre (MX/NL) and Cyprien Gaillard (FR/DE), three artists with whom Latitudes has worked in the recent past and whose work will also be featured in Max Andrews' essay "'A Dark Spot of Exasperation: From Smithson to the Spime'" in the forthcoming publication 'Robert Smithson: Art in Continual Movement' (ISBN 9789081531481) to be published by Alauda Publications in early 2012. 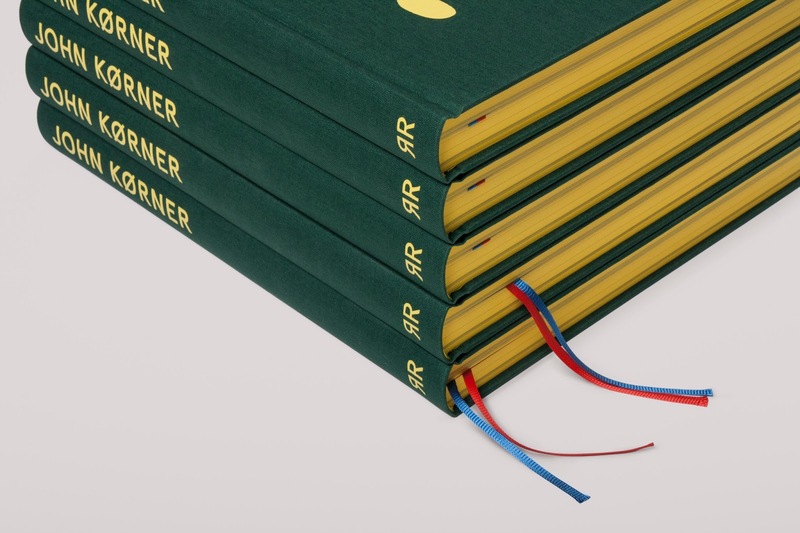 The essay and The Ultraperiferic both feature Jorge Satorre's 'The erratic. 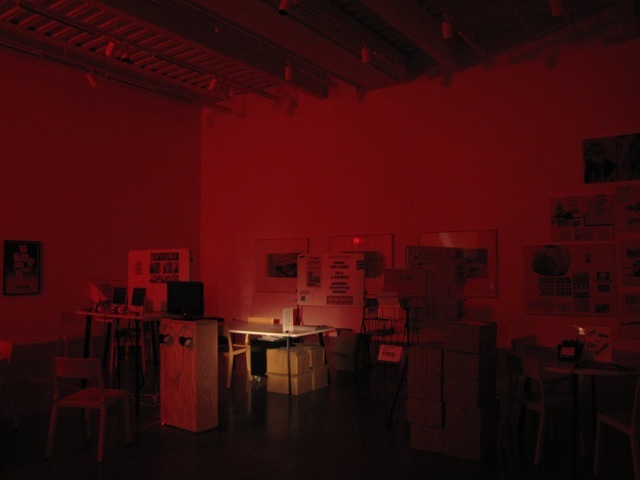 Measuring compensation' (2009) which was produced in the context of 'Portscapes' and recently featured in his exhibition at Labor, Mexico City. 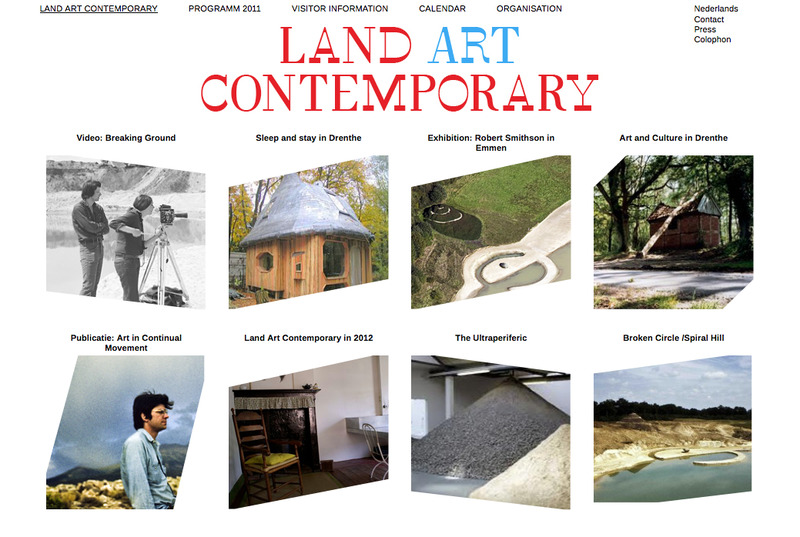 Land Art Contemporary is an initiative of STICHTING LACDA, Drenthe, a foundation established in 2011 by the Sanders-Ten Holte family. 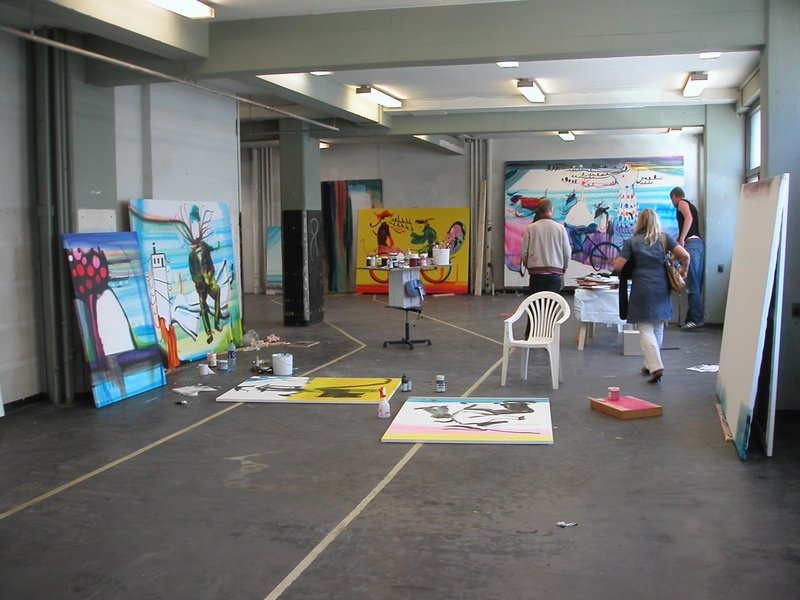 The program has been made possible thanks to (content and financial) support from SKOR | Foundation for Art and Public Domain, Province of Drenthe, European Agricultural Fund for Rural Development: Europe Investing in Rural Areas (LEADER), Municipality of Coevorden, Municipality of Emmen, Cultuurfonds BNG and the Sanders-Ten Holte family. 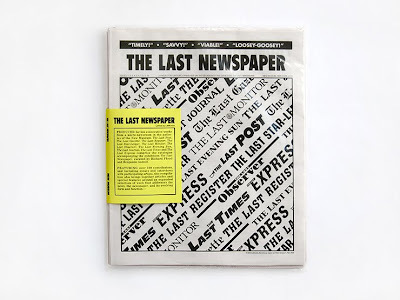 'The Last Newspaper' exhibition catalogue is now available for purchase (€15, to buy email [email protected] ) as well as for distribution from Motto Berlin. 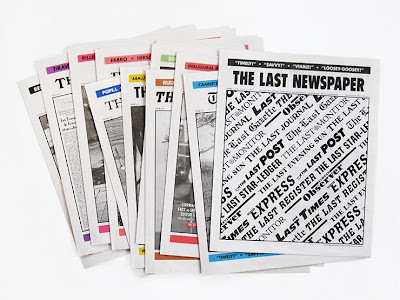 'The Last Newspaper' was a hybrid exhibition inspired by the ways artists approach the news and respond to the stories and images that command the headlines. 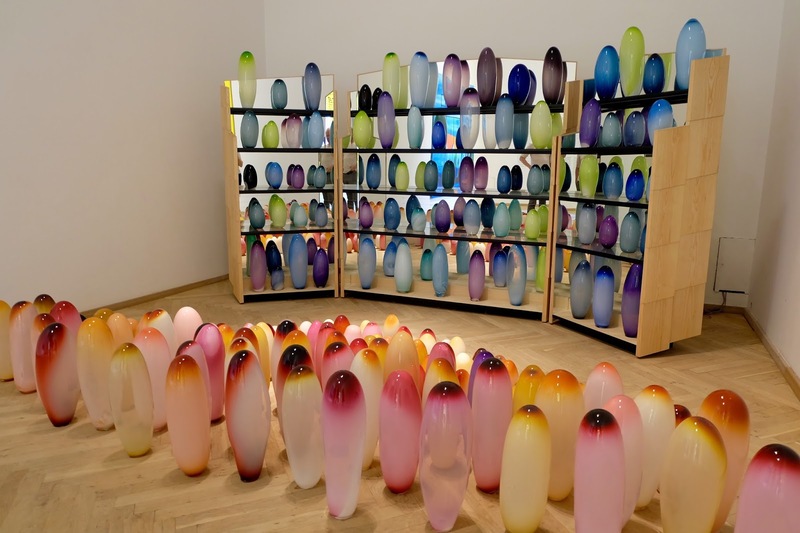 Co-curated by Richard Flood and Benjamin Godsill, the exhibition was held at the New Museum, New York, from 6 October 2010 to 9 January 2011. Alongside the exhibition, a number of partner organisations, including Latitudes, used on-site offices to present their research and stage public dialogues. 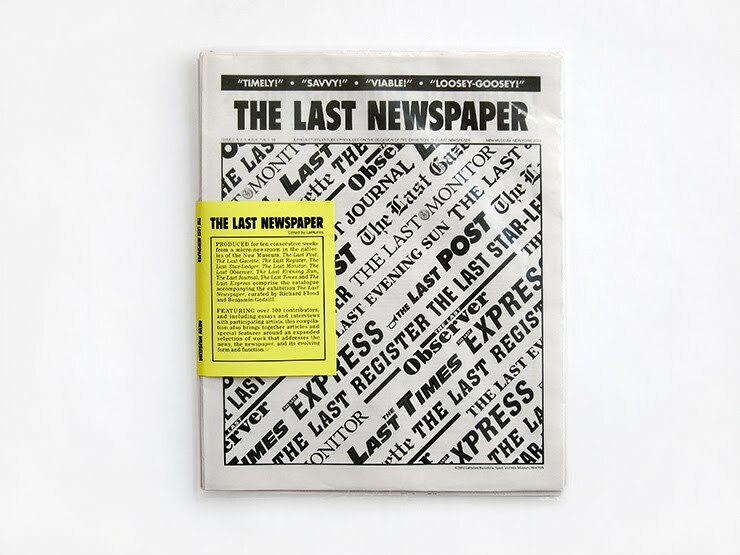 ‘THE LAST POST’ / ‘THE LAST GAZETTE’ / ‘THE LAST REGISTER’… was an 12-page free weekly newspaper and an incremental exhibition catalogue edited during a 10 week editorial residency byLatitudes . 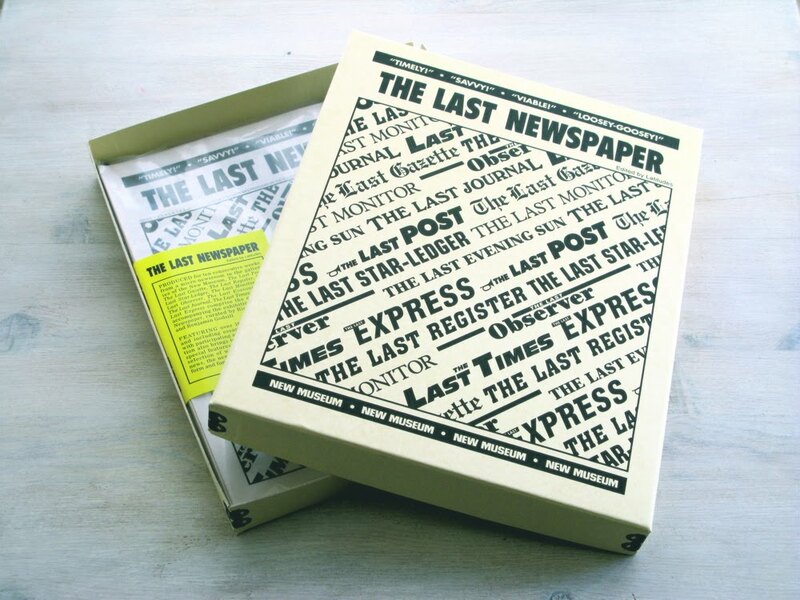 This published record, designed by Chad Kloepfer and Joel Stillman, is the surrogate catalogue of The Last Newspaper. 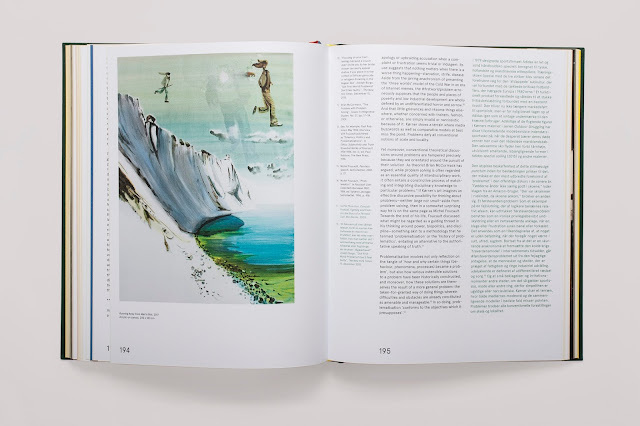 Featuring over 100 contributors, including essays and interviews with participating artists, the compilation also brings together articles and special features around an expanded selection of work that addresses the news, the newspaper, and its evolving form and function. 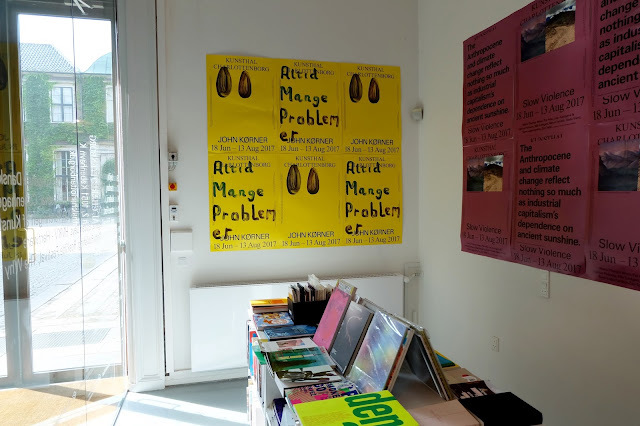 Motto Berlin, a store dedicated to magazines, books and self published printed matter. Various presentations and publication launches take place every month. Above and below: Installation view. Photo: Jens Møller Sørensen. Courtesy the artists. 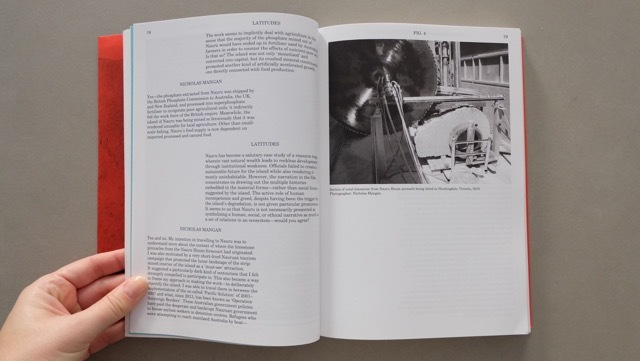 —> Slideshow of the publication. 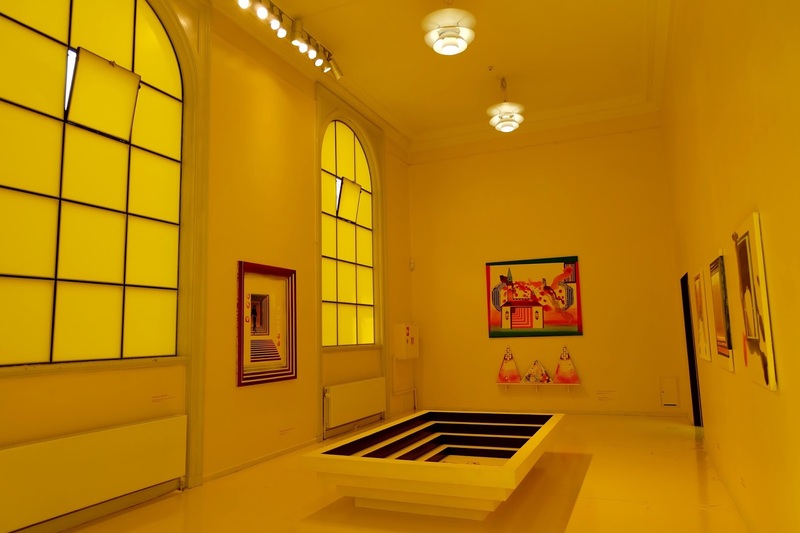 —> Slideshow of the exhibition. The exhibition 'Christina Hemauer | Roman Keller: United Alternative Energies', is the most comprehensive exhibition of the Swiss duo's work to date, presenting ten works of which four are new productions. A 36 full-colour page booklet can be purchased from the Århus Art Building for 35 DKK (aprox. €4,70). 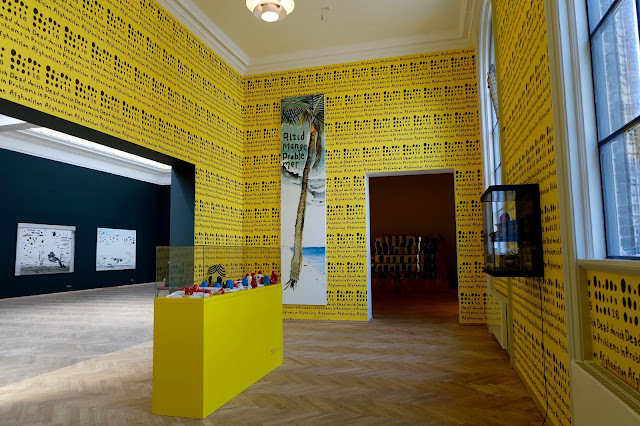 Exhibition remains on view until 3 April 2011. The exhibition 'Christina Hemauer & Roman Keller: United Alternative Energies' will open on Friday 21 January from 5pm and remain on view until 3 April 2011. Saturday 22 January, 11am: Panel discussion with Hemauer | Keller and the other exhibiting artist Søren Dahlgaard. 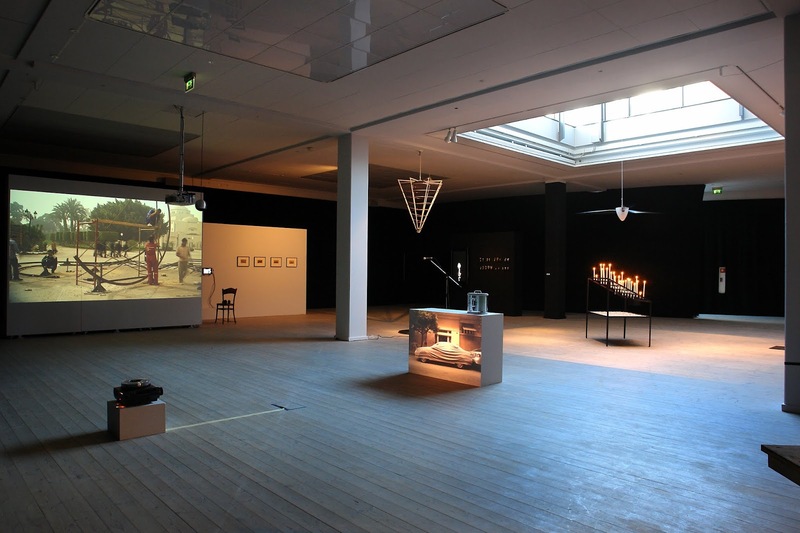 The exhibition ‘Christina Hemauer and Roman Keller: United Alternative Energies’ is the most expansive presentation of the work of the Swiss duo to date, featuring ten works, four of which are new productions. Hemauer | Keller investigate energy – as an allegorical concept, an invisible force, and a defining theme of geopolitics and modernity. One of the main focuses of their practice is the history of oil and the fate and future of its competing alternatives, notably solar power. Hemauer | Keller make use of a range of strategies – re-enactment and performance, as well as documentary video, sculpture and text. Their work often provides an opportunity to revitalize key historical moments. 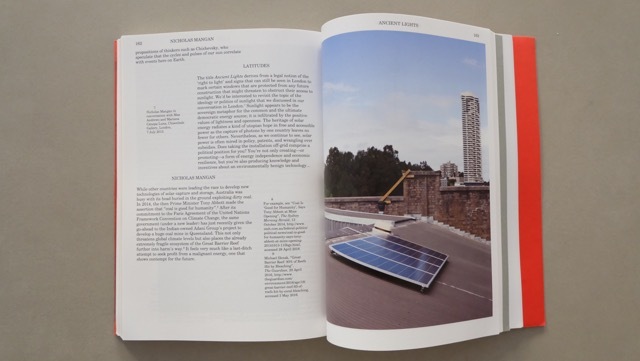 For example, the 66 minute documentary essay ‘A Road Not Taken’ (2010) examines former US President Jimmy Carter’s early and ultimately futile efforts to raise awareness about oil dependency, as symbolized by the installation, in 1979, of solar panels on the roof of the West Wing of the White House. Also featured in this exhibition is No.1 Sun Engine (2008–9). In 1913, American inventor Frank Shuman inaugurated the first large-scale solar power generator near Cairo, Egypt. Although it was economically viable compared to coal power, the plant was only used for one year. 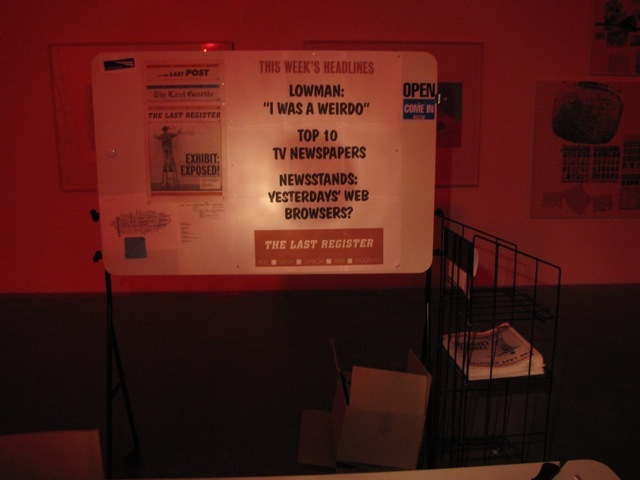 In 2008 the artists reconstructed two segments of this pioneering facility and established an information kiosk where local residents and passers-by could discover and contribute to its story. Christina Hemauer (1973) and Roman Keller (1969) live and work in Zürich, Switzerland. 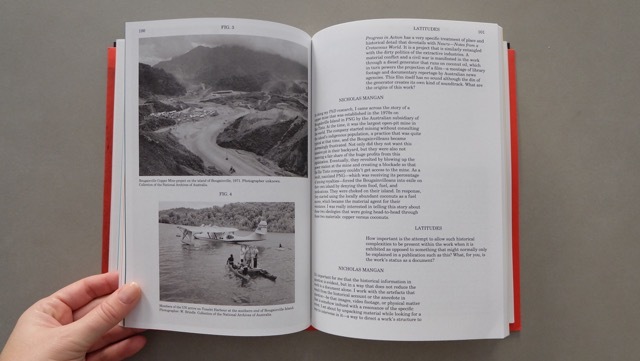 Recent exhibitions and projects include: Globalising the Internationale, for Portscapes (2009) and Portscapes exhibition, at the Museum Boijmans van Beuningen, Rotterdam (2010); 11th Cairo International Biennale, El Cairo (2008–9), Nettoyage énergétique, Center Contemporary Art Fribourg (2007), A Manifestation, a Dedication and a Place to get the Word out, Swiss Art Awards, Basilea (2007); At this place, Postpetrolism was heralded on 27 April 2006, Kunsthof, Zurich (2006). 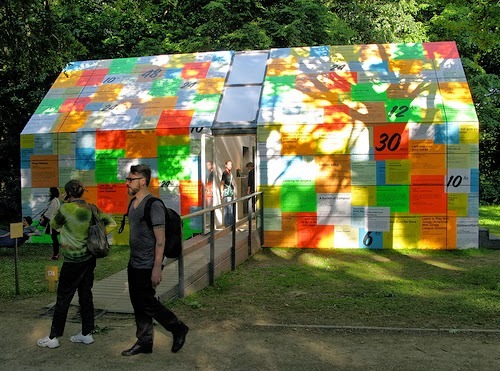 The exhibition is one of the 5 proposals selected from over 600, received via Aarhus Art Building's open submission call, and launches the 2011 season 'IMAGINE – towards an eco-aesthetic'. 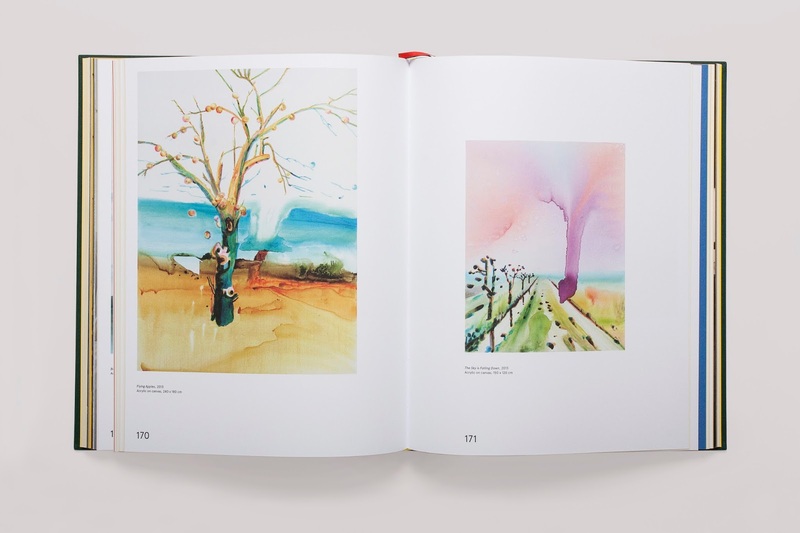 A 36-page full colour publication in English and Danish will be printed on the occasion of the exhibition. It includes an introductory essay by the curators on the artists' practice as well as short texts about each of the works included in the exhibition. 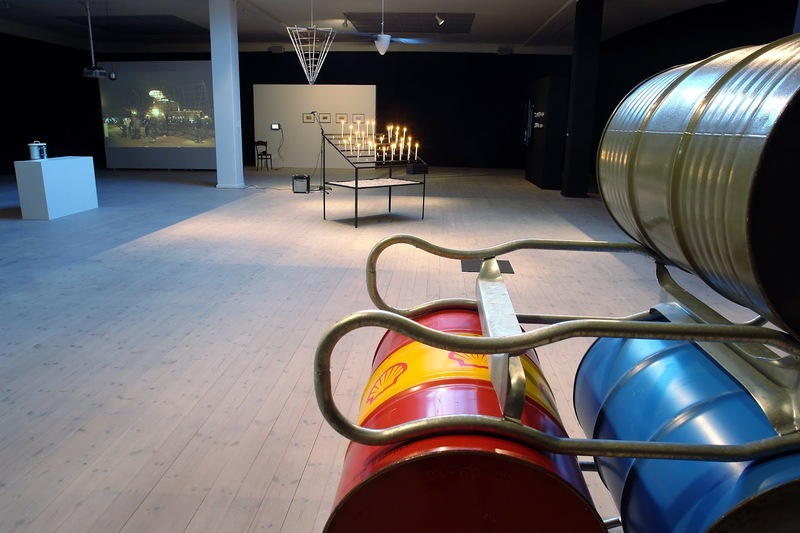 ‘Christina Hemauer & Roman Keller: United Alternative Energies’ has been possible thanks to the generous support of The Danish Arts Council Committee for International Visual Art; Pro Helvetia and the Stanley Thomas Johnson Foundation. Please contact Pernille Lyngsø, [email protected] or phone +45 86 20 60 53. 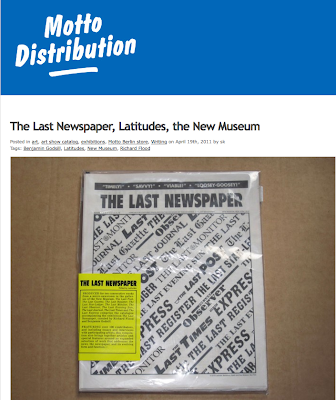 – A 'regular edition' in a poly bag with sticker containing the 10 newspapers + a 4 page black-and-white supplement with editorial, contents page and index ($15, $13.50 museum members). – A special edition: silkscreened archive box containing the regular edition ($50). Both can be purchased from the New Museum Store. 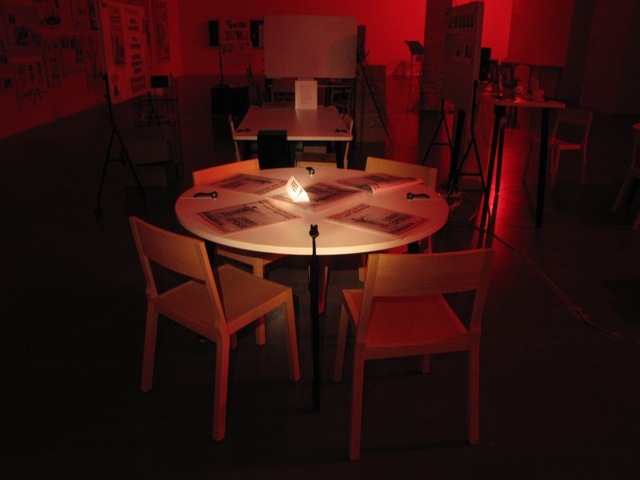 Coinciding with the end of our New Museum editorial project we'd like to share these great shots of what has been our working space during the past 10 weeks at the New Museum: our micro-newsroom during the night. 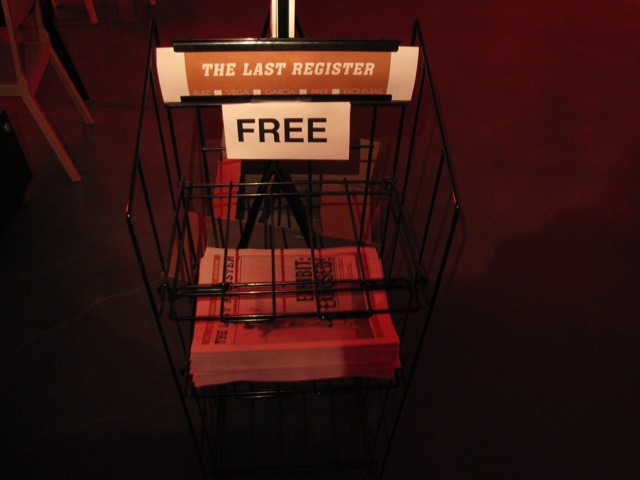 The photos have been taken by New Museum night guard and photographer Steven Slawinski during the third week of our editorial residency – when 'The Last Register' (#3) was the newspaper of the week. 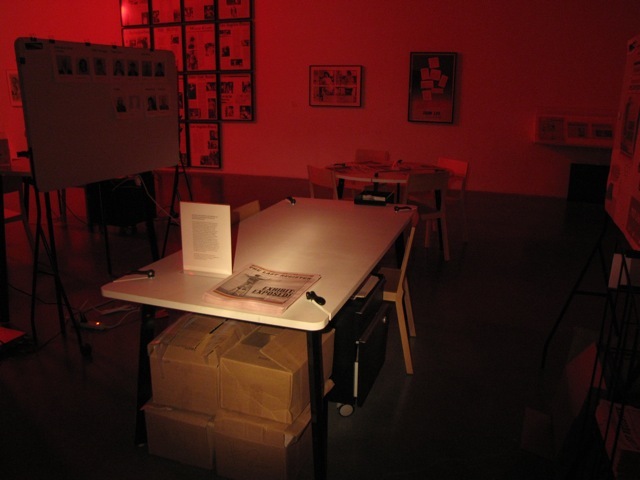 We would like to thank Steven for sharing his archive, and to New Museum guard Carol Fassler for putting us in touch. We would like to express our thanks to everyone at the New Museum. Thank you to Lisa Phillips, Toby Devan Lewis Director, and The Last Newspaper co-curators Richard Flood, Director of Special Projects and Curator at Large, and Benjamin Godsill, Curatorial Associate, for hosting us and inviting us to collaborate in this expansive and timely project. Our sincere gratitude and praise are due to Richard and Benjamin for their support and trust and for the brave exhibition whose works have become our local community. Thank you to Joshua Edwards, Exhibitions Manager and Shannon Bowser, Chief Preparator for sharing expertise on producing Luciano Fabro’s Pavimiento-Tautologia. Praise is due to Desiree B. Ramos, Curatorial Fellow; Eungie Joo, Keith Haring Director & Curator of Education & Public Programs; Cris Scorza, Manager of Tours and Family Programs and Joseph Keehn II, Associate Educator; to Gabriel Einsohn, Communications Officer and Annie Wachnicki, Marketing Manager for their help in many ways. We are most grateful to each of the inspiring New Museum guards and guides for their support and interest in our weekly progress and for taking care of our working space. We would like to express our gratitude to Marta Rincón and Eloisa Ferrari for securing the financial support offered by The State Corporation for Spanish Cultural Action Abroad (SEACEX), which has made it possible for us be in New York during these months. The graphic design of the newspapers has been an absolutely critical element to the tone of the project and we salute Chad Kloepfer and Joel Stillman, who have been so generous with their time and incredible talent in establishing the visual identity of The Last... newspapers, and in giving up their weekends laying them out. 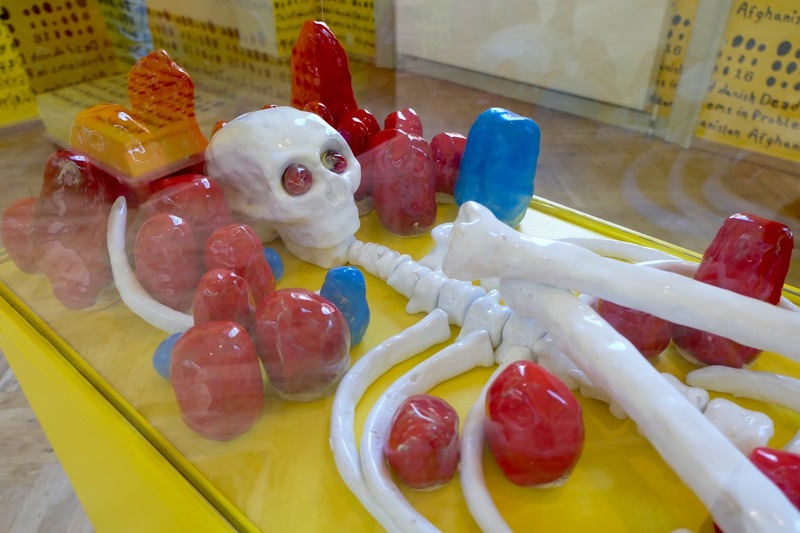 Thank you to Daniel Thiem, Retail Operations Manager at the New Museum, for taking care of the afterlife of this print adventure, and to Tammy Lin at Linco Printing for making the printing and delivery run smoothly. Sharing the third floor of the New Museum with the other partner organizations has been a memorable experience and we are particularly appreciative of Alan Rapp as well as Virginia Millington and Natalia Fidelholtz – our temporary neighbors at the New City Reader and StoryCorps respectively. The project would also not have been possible without the assistance of our news team, who have been crucial in their dedication and good humor, and in toiling late hours, and while juggling other commitments, in writing sterling words. Kudos to Editor-at-Large Janine Armin, to Greg Barton, Irina Chernyakova, Collin Munn and Gwen Schwartz. We would also like to highlight the generous contributions of Adam Chadwick, Julienne Lorz, Andrew Losowsky and our London correspondent Lorena Muñoz-Alonso. We have been pleased to have been able to involve an incredible network of writers, curators, artists and journalists that week after week have graced, and been splashed over, the pages of 'The Last...' Visual artist Francesc Ruiz, project cartoonist with his series ‘The Woods’, and our advertising department, artist Ester Partegàs, we thank especially for their amazing work and for their stamina in signing up to the weekly deadlines. 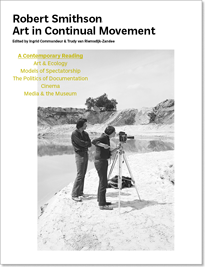 We are indebted to all of the participating artists and organizations as well as many other individuals for their efforts, for having trusted our editorial skills and for having given time and contributions pro bono – Ignasi Aballí; Lars Bang Larsen; Judith Bernstein; Dara Birnbaum; Pierre Bismuth; Andrea Bowers; Fernando Bryce; Luis Camnitzer; Sarah Charlesworth; Emily Cheeger; Doryun Chong; City-As-School class; Ana Paula Cohen; Scott Cole; Christine Cooper; Holly Coulis; Marc d'Andre; Chris Dercon; Patricia Esquivias; Jacob Fabricius; Luciano Figueiredo; Angela Freiberger; Jason Fry; Simon Fujiwara; Dora García; Martin Gran; Hans Haacke; Ilana Halperin; Rick Herron; Ridley Howard; Marcel Janco; Adrià Julià; Maria Loboda; Nate Lowman; Renzo Martens; Rob McKenzie; Simone Menegoi; Aleksandra Mir; Rodrigo Moura; Nick Mrozowski; Angel Nevarez & Valerie Tevere; Sophie O'Brien; Damián Ortega; Alona Pardo; Amalia Pica; Michalis Pichler; Ed Pierce; Peter Piller; William Pope L.; Michael Rakowitz; Christian Rattemeyer; Yasmil Raymond; Kolja Reichert; Mauro Restiffe; Kathleen Ritter; Kirstine Roepstroff; Julia Rometti & Victor Costales; David Salle; Mike Santisteven; Joe Saltzman; Ines Schaber; Paul Schmeltzer; Charity Scribner; Manuel Segade; Adam Shecter; Harley Spiller; Stephen Spretnjak; Alexandra Tarver; Mi Tijo; Wolfgang Tillmans; Rirkrit Tiravanija; Nicoline van Harskamp; Pablo Vargas Lugo; Sergio Vega; Marie Voignier; Mark von Schlegell; Haegue Yang; Carey Young; Sarah Wang; Warren Webster; and Jordan Wolfson. Thanks too the New Museum Facebook and Twitter contributors: aodt; Kristi Collom; Michele Corriel; djnron; Isadora Ficovic; A.J. Fries; Rachel Elise Greiner; Sioux Jordan; Eleanor Martineau; Acht Millimeter; Sofia Pontén; Jenny Pruden; Bonnie Severien; Kate Shafer; Liz Shores; Goso Tominaga; and Anne Wölk. 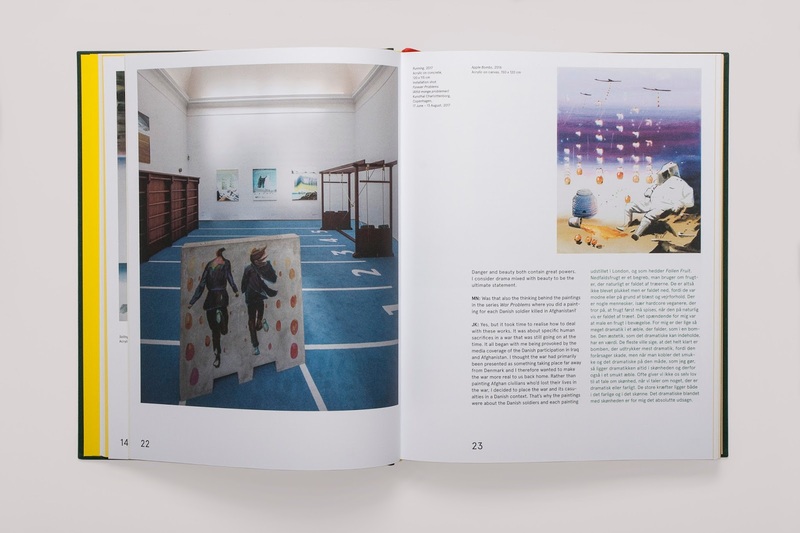 We would also like to thank those who have helped us obtain images or permission to reprint texts: Barbican Art Centre, London; Edoardo Bonaspetti, Mousse magazine; Bugada & Cargnel, Paris; Janine Iamunno, patch.com; Nick Hunt/PatrickMcMullan.com; Jeff Khonsary, Fillip; Lisa Middag at the Walker Art Center, Minneapolis; kurimanzutto; Michele Robecchi; Benoit Pailley; Peres Projects, Berlin; Katie Sokolor/Gothamist. – Latitudes (Max Andrews & Mariana Cánepa Luna), December 2010. Excerpted from 'FROM THE EDITORS’ DESK – Last words, clarifications, frequently asked questions, and thanks from Latitudes' originally published in 'The Last Newspaper' catalogue. Opening today, Håkansson's exhibition at the Museo Tamayo (until 20 September) is the outcome of recordings carried out at the Montes Azules, El Triunfo, and Monarch Butterfly Biosphere Reserves, and photographs and videos obtained over four weeks by twelve remote cameras placed by the artist in different spots throughout the southern Lacandon Rainforest, Mexico. 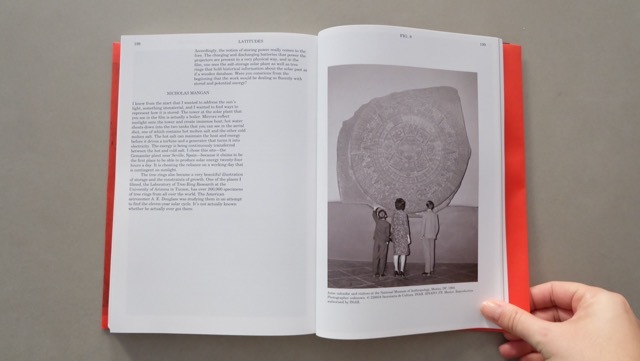 Curated by Tatiana Cuevas for the Tamayo, the catalogue features an extended essay by Latitudes' Max Andrews. 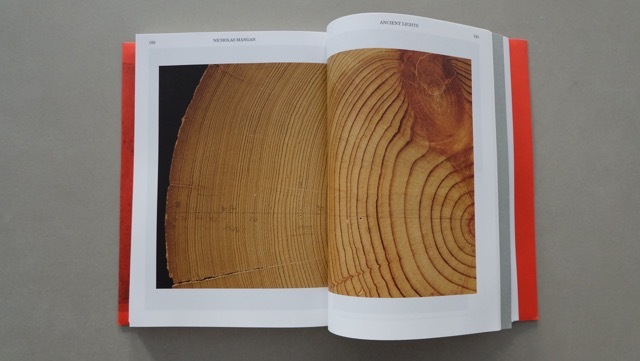 See photos of the catalogue here. Read about the show on ARTFORUM critics' picks. 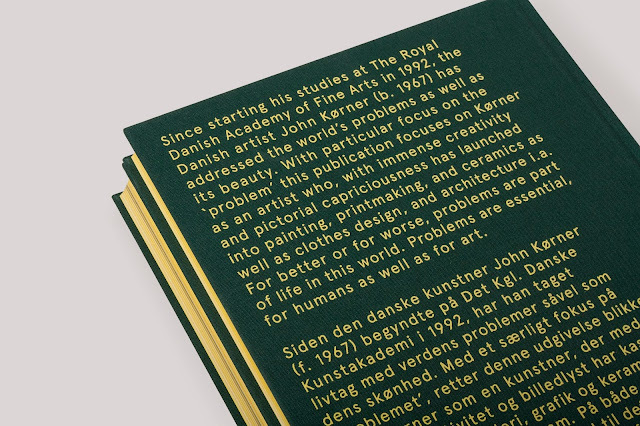 Extract taken from the catalogue essay of the publication '2006 Problems: John Kørner' by Latitudes' Max Andrews. 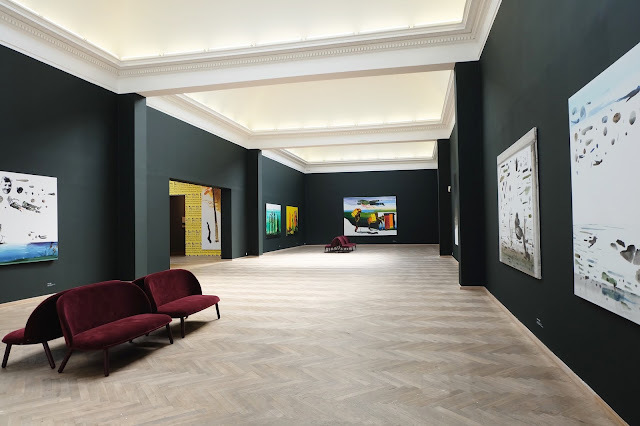 A 3-hour train from Copenhagen is the ARoS Art Museum in Århus, where the John Kørner's exhibition 'Århus Bank' finished 17 September. 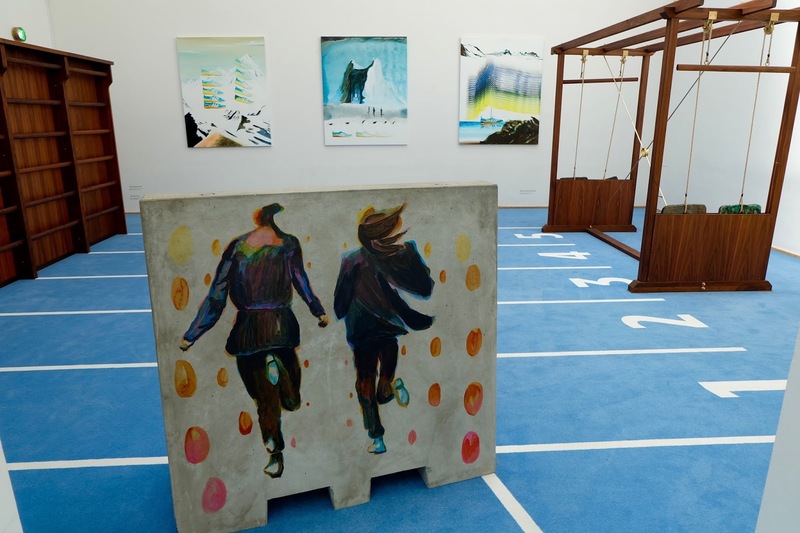 Paintings, ceramics and a video 'My favourite seven paintings': a great opportunity to be immersed in all things Kørner. 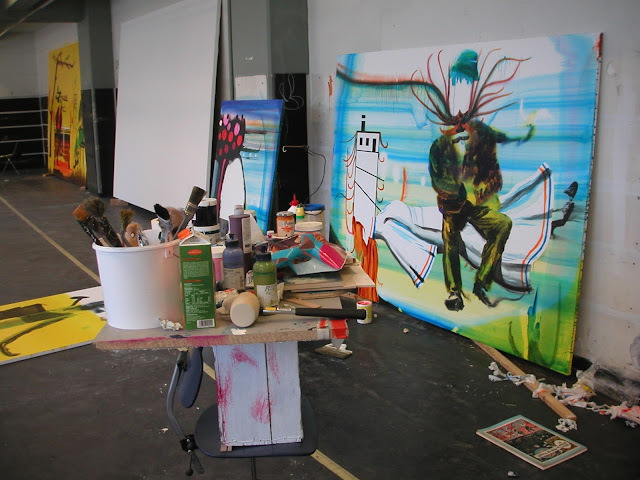 In his video he presents some of his paintings to different audiences (kids, old folks, his art professor, birds, etc). 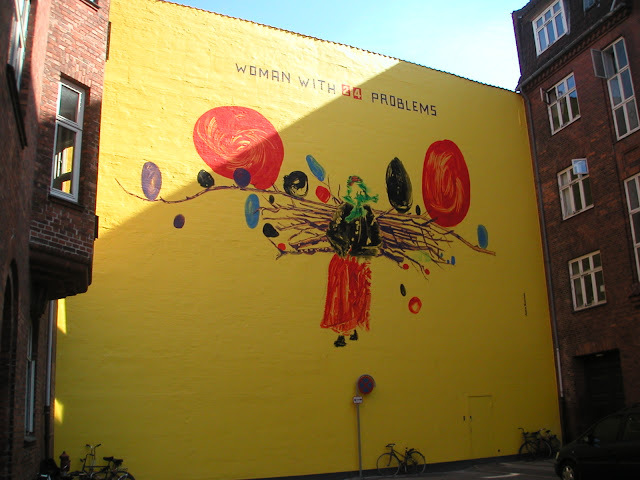 One of the works he presents in the video is this mural, commissioned by the Copenhagen City Hall. 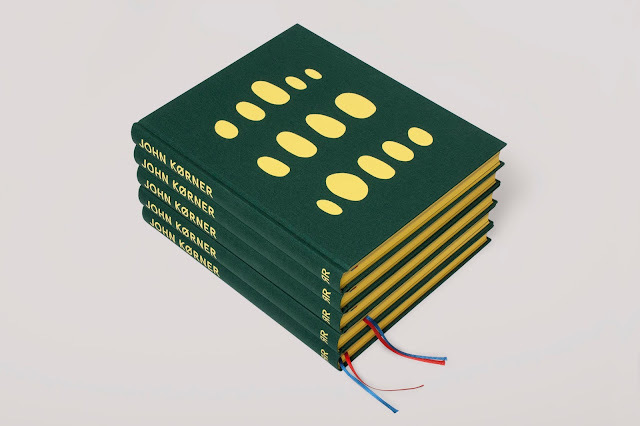 We are working with John on the publication for his upcoming show at Victoria Miro Gallery, London which opens at the end of November.